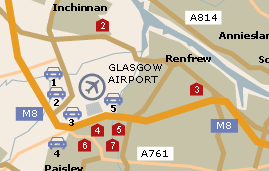 Airport Parking offers a wide range of options for parking at Glasgow Airport. With both on and off-airport options, there will be something on offer to suit every need and budget. For a quote please click here. So as well as being a more convenient option, it may also be easier on your finances. To view the hotels on offer at Glasgow Airport and get a quote please click here. Bureau de change in international arrivals, check-in, main concourse and international departures. Cash dispensers located throughout the terminal building. Payphones located both before and after security. Children's play area and Puzzle tables. Landside Newsagents, health and beauty, gifts and accessories. Airside Duty and tax free shops, selling alcohol, perfume, cigarettes and gifts.